I made most of this card sometime ago. It is the second card I am sending Jennifer! The background was made by inking the inside of a plastic folder, a few drips from 2 - 3 different colors, then squishing a glossy sheet of paper between the inked up folder. I will try to make a tutorial to explain that better. (I just have to find some time first...lol). It was then stamped w/ Staz-on ink in black, I think I used a Hero Arts stamp, but I could be wrong. And I really don't want to dig through my cache of rubber stamps right now to find out. 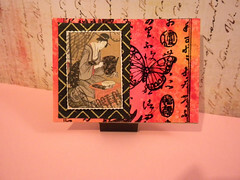 :) I stamped over the geisha image with postal themed stamps, then mounted the image to some fancy hand screened, yummy, fiber-y paper. Tah-da!